Built in 1874, The Mark Twain House was the private residence of Samuel Clemens (a.k.a. Mark Twain) and his family for seventeen years. During this time, Twain wrote his most famous works in the 25-room Picturesque Gothic mansion. The Mark Twain House & Museum is open for tours year-round. 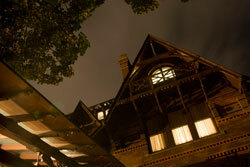 GRAVEYARD SHIFT GHOST TOURS are offered in October and other select dates. Reservations are required for ghost tours. Please visit our website for schedule information. Designed to the Clemens' specifications, The Mark Twain House was ahead of its time in terms of technology and amenities. The family lived in the home until 1891. Their eldest daughter Susy died in the home after a sudden onset of meningitis. After the Clemens Family left the home, the house was sold to another family and eventually became a school, a library, a boarding house and is currently a beloved historic house museum known the world over. The following paranormal activities have been experienced in the home. Reports have come from guests, guides, security staff and some have been captured on episodes of SyFy's "Ghost Hunters" and "Ghost Hunters Academy": knocks, bangs, male and female full-body apparitions, spectral voices, EMF spikes, lights that were turned off get turned on again, children's laughter, mischievous tugs on clothing, guests feeling like they are being watched, the smell of cigar smoke, a silver serving tray thrown at a security guard in the basement, footsteps, shadow movement, and more. The house has been visited by Lorraine Warren and John Zaffis. Smoking Gun Research Agency has conducted an investigation of the location and found it to be energetically active. We apologize that we are unable to host further paranormal investigations at this time.